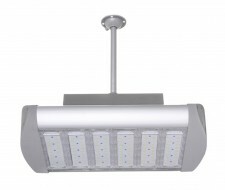 High Bay lights are manufactured with a narrow beam angle (40/80) for use within buildings with high ceilings whereas Low Bay lights have a wide beam angle (170) especially for buildings with ceilings under 5m. Aluminium housing available in silver, dark grey or black. Air flow thermal management system. Integrated Meanwell HLG dimmable driver allowing 3-in-1 dimming function (1-10V, PWM or resistance). IP66 rated which makes it ideal for wet & dusty applications. Polycarbonate cover (no glass) making it robust. Built-in protection for short circuit, overload, over voltage & over temperature. Vibration & shock testing is carried out during manufacturing. Lamp Efficiency 105lm/W, Power Factor >0.9, 50,000 hrs useful lifespan. Available in cool white (70CRI), natural white (75 CRI) or warm white (70 CRI). Available with either a 40, 80 or 170 degree beam angle. Timer & motion sensor options.